Each item is composed of a word or sentence and a corresponding picture plate. The examiner reads the stimulus aloud and the student is asked to answer a question, finish a sentence, or combine sentences. 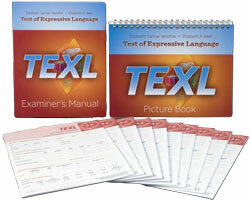 The TEXL test items are ordered by difficulty within each subtest. Age-related entry points, basals, and ceilings minimize testing time. Norms for the TEXL are based on a nationally representative sample of 1,205 children. 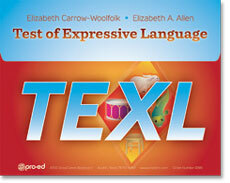 The TEXL was co-normed with the TACL-4, which assesses receptive language. Reliability and validity studies were conducted using both individuals with normal language abilities and those with a diagnosis of learning disability, ADHD, deaf or hard of hearing, articulation disorder, language impairment, autism spectrum disorder, or intellectual disorder. Internal consistency coefficients alpha were between .93 and .95 for the subtests, and .97 for the Expressive Language Index. Concurrent validity with popular criterion measures of expressive language ranged from .72 to .86. Testing takes 2030 minutes. Raw scores can be converted to percentile ranks, standard scores, and age equivalents.